Few stories in history have received such varied treatments as Dickens’ A Christmas Carol. In fact it has so many adaptations that Wikipedia has its own page just to list them all. From opera to graphic novel, from the ridiculousness of Bill Murray to the seminal performance by Alastair Sim, Ebenezer Scrooge’s tale of transformation continues to be reinvented, reworked and re-imagined. [pullquote]Another of the growing options for those that are looking for something a little different during the holiday season, one thing is for sure: A Twisted Christmas Carol may very well be the cure for your holiday humbugs. 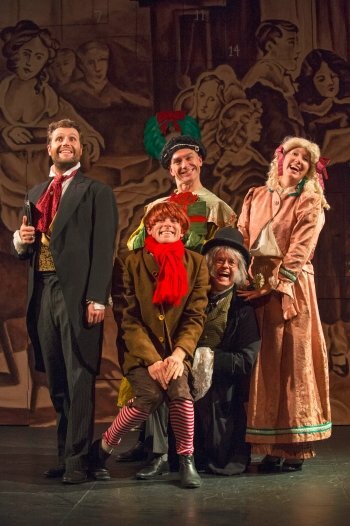 [/pullquote]Added to that growing list is the Arts Club Theatre Company’s production of A Twisted Christmas Carol, a partly scripted, partly improvised retelling of this ubiquitous and classic story. And for those that dread yet another showing of the 1951 black and white film that, along with It’s A Wonderful Life, gets overplayed on television this time of year, it is not only a worthy addition to the Scrooge catalog, but it is at times quite brilliantly funny too. Originally produced by Rock Paper Scissors, A Twisted Christmas Carol was last seen on Granville Island nearly ten years ago. Returning to this production from that 2005 show are Diana Frances as Mrs. Cratchit and Jeff Gladstone as Tiny Tim. Replacing John Murphy, who now acts as the show’s director, as Scrooge is Gary Jones, and Kirk Smith and Bill Pozzobon round out the cast as Dickens and Mr. Cratchit respectively. 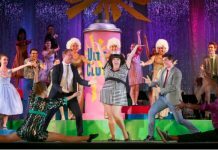 As with other improvised shows, much of what we see on stage is plucked directly from the suggestions by audience members. On opening night we saw Scrooge’s business become a gymnastics school, Tiny Tim’s affliction became Attention Deficit Disorder and the Ghost of Christmas past was a very funny Bill Pozzobon as Julius Caesar. These choices will change from show to show, but based on how this very capable cast embraced these seemingly disparate suggestions on opening, it isn’t hard to see how even the most random of idea can be mined for comedy gold. The cast of the Arts Club production of A Twisted Christmas Carol. Photo by David Cooper. Acting as the improv equivalent of narrator and host, Smith has the daunting task of keeping things moving along under the guise of the playwright himself. While he struggled a bit to keep it all tightly under control, largely in the second act, much of that has to do with wrangling an audience who are yelling out suggestions and in the numerous bits where an audience member is pulled into action (you’ve been warned!). In fact, it was the audience participation bits that became a little repetitive, but given those particular scenes are fraught with potential disaster there is a level of danger that still keeps things interesting. On opening night, by design or just plain good luck, Smith found a near perfect Marley for the scene at Fezziwig’s. You can tell Frances and Gladstone have done this before as they felt very comfortable in reprising their roles. Frances was particularly funny in keeping the holiday dinner scene alive even as she is given yams to work with, and it had a wonderful Monty Pythonesque feel about it. Jones’ Scrooge is a hoot and as he and the other cast members play the classic Murder Endowment improv game you can see their combined skills working in almost perfect comedic harmony. While accents come and go, audiences will appreciate them mostly when they are gone. The advent calendar set from Joao Carlos d’Almedia, Michelle Porter and David C. Jones is inspired with its series of hidden compartments and doorways that actually help count down the scenes. It will also have the older members of the audience thinking of Rowan and Martin’s Laugh-in. Another of the growing options for those that are looking for something a little different during the holiday season, one thing is for sure: A Twisted Christmas Carol may very well be the cure for your holiday humbugs. A Twisted Christmas Carol directed by John Murphy. Originally produced by Rock Paper Scissors. Based on the novel by Charles Dickens and an idea by David C. Jones. Written by Tammy Bentz, Toby Berner, Ian Boothby, Chris Casillan, Joe Davies, Diana Frances, Nicolas Harrison, Sharon Heath, Christopher Hughes, David C. Jones, Scott Owen, Michelle Porter, Karen Rose and Charles Dickens. An Arts Club Theatre Company production. On stage at the Revue Stage (1601 Johnston St, Granville Island) until December 27. Visit http://artsclub.com for tickets and information.